(KERI) The winter months bring on an annual dig for my favorite stew recipes. There are two I absolutely adore and this one is fairly new to my repertoire (the other coming soon, promise). There’s something wonderful about a thick, hearty stew that makes a cold, Colorado Sunday as cozy as a blazing fire and a familiar blanket. 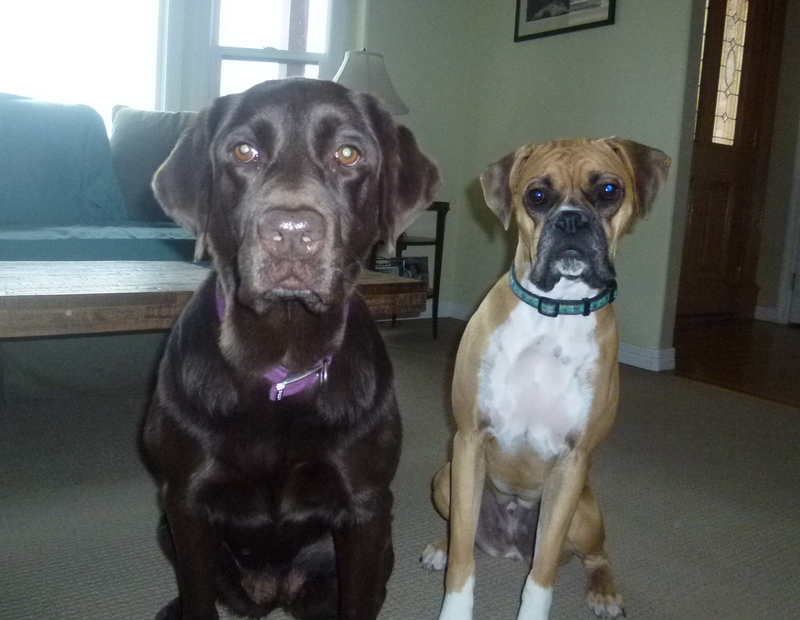 The cold, the snow, and the smell of stew in the house just makes you want to hunker down with your bunnies – and maybe your boxers and your labradors. So that’s what we do. But wait, this isn’t a dog blog. I digress. But they are cute, aren’t they? Now, the story behind this recipe: Friends had us over for dinner a couple of years ago and they served a delicious beef stew made with loads of smokey paprika and a hint of piquant peppers. It was so unique, I was smitten. I didn’t have to beg for the recipe, but I did have to wait. Our friends had gotten it from a friend, who had to translate it into English only to find it online thereafter…blah, blah, blah. Finally, there it was, in my hot hand, written in a quirky, old-fashioned kind of way. I love, love, love the caraway, the paprika, and those peppers – oh those peppers make this dish. 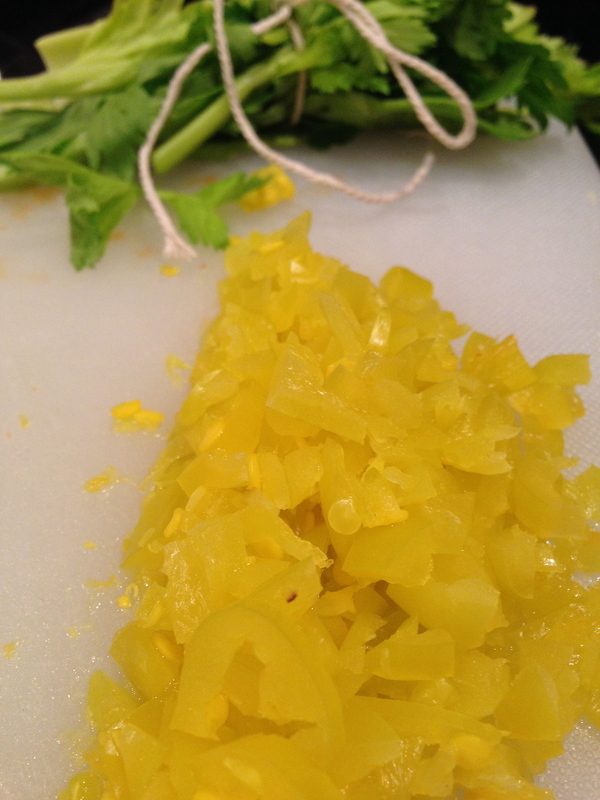 They are the bright yellow highlighter, the underscore that adds the perfect depth to the stew. The original recipe is for a soup, but I find this so much better with the sauce thickened into a stew. Serve with the potatoes (and additional roasted veg of your choice) on the side (vs. in the stew itself). You’ll want to play with the amount of stock you use – I don’t think I’ve ever used more than 3 cups total – as well as cooking with and without the lid on the Dutch oven. I found bouncing back and forth – lid on, then off, then on, then off – helped cook the meat and the sauce to the perfect consistency. 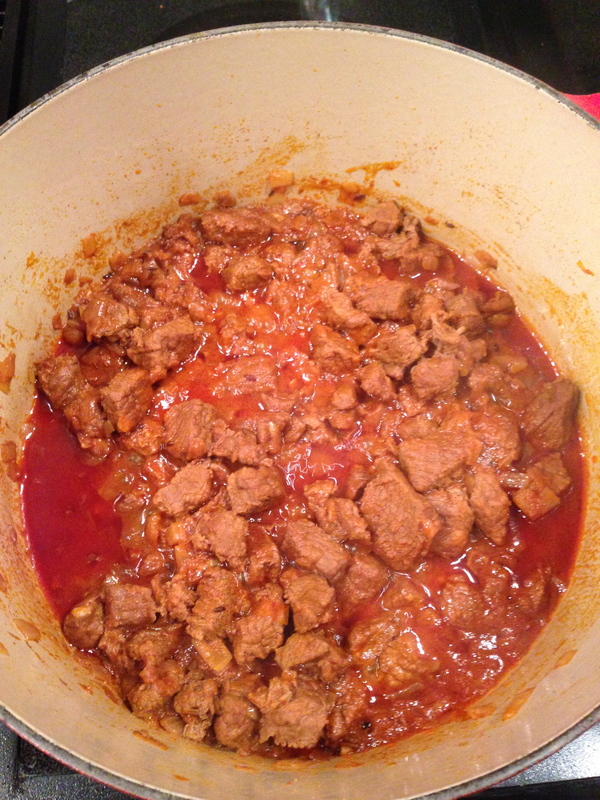 Keep the heat up, and stir often to keep meat from sticking to the bottom. Cooking at a high temperature also produced the best result for tender meat. And be patient. Good things come to those that wait. Here’s to January. And the cold. And snuggling with your bunnies. And to the Hungarians who originated this stew. Melt butter in a Dutch oven over medium heat and saute onions until golden brown. Stir in minced garlic and cook 2 minutes. Sprinkle caraway seeds and cook 1 minute longer. Remove pot from heat and allow to cool 15 minutes. Sprinkle paprika and stir well. Return pot to burner and crank up the heat to high. Mix in beef and 2 teaspoons of salt and stir frequently until the meat is no longer pink. Stir in 1/2-3/4 cup of the beef stock and allow stew to cook over medium high heat. Cover and cook, stir frequently until much of the liquid is evaporated, about 30 – 45 minutes. Continue to cook with heat on medium and adding beef stock by 1/2 cup increments, with cover of pot on and then off for another 1.5 – 2 hours until beef becomes soft. Add the celery leaf bundle and chopped banana peppers and continue to cook with heat on medium for another 30-45 minutes until meat is very tender and sauce is thick. Stir in red wine vinegar. Serve stew with crushed roasted potatoes (below) and other roasted veggies of your choice. Preheat oven to 425 degrees. 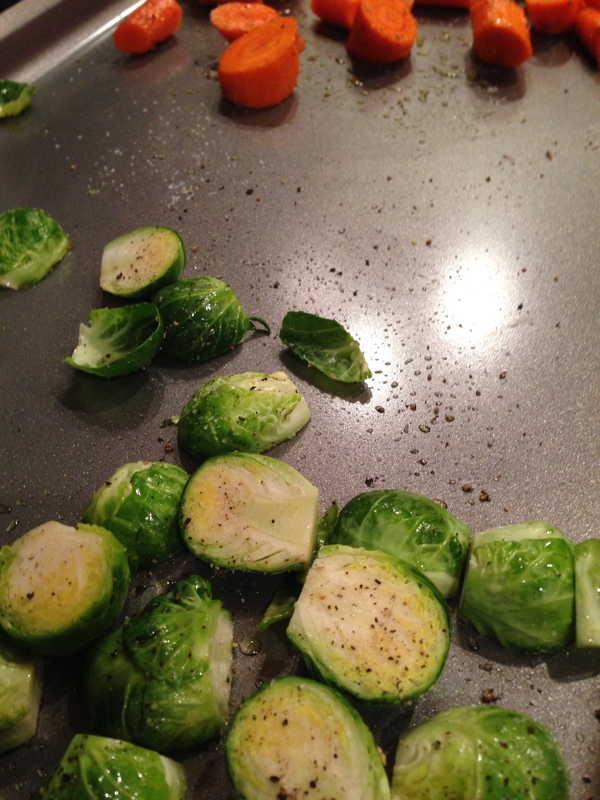 Spread potatoes on rimmed sheet pan and drizzle with olive oil, salt and pepper. Mix with clean hands to ensure all potatoes are equally coated. Roast for 45 minutes or until potatoes are fork-tender. Remove from oven and, with potato masher or fork, softly crush each potato until skin is broken and potato is flat. Roast for another 20-25 minutes, flipping potatoes once until skin is slightly brown and potato is very tender. 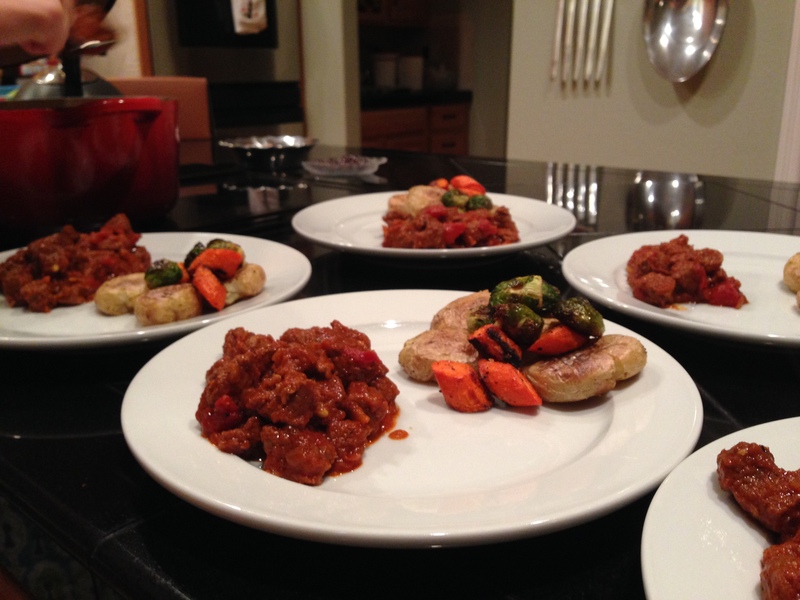 This entry was posted in Main Dishes and tagged beef, Goulash, stew. Bookmark the permalink.